WOW! 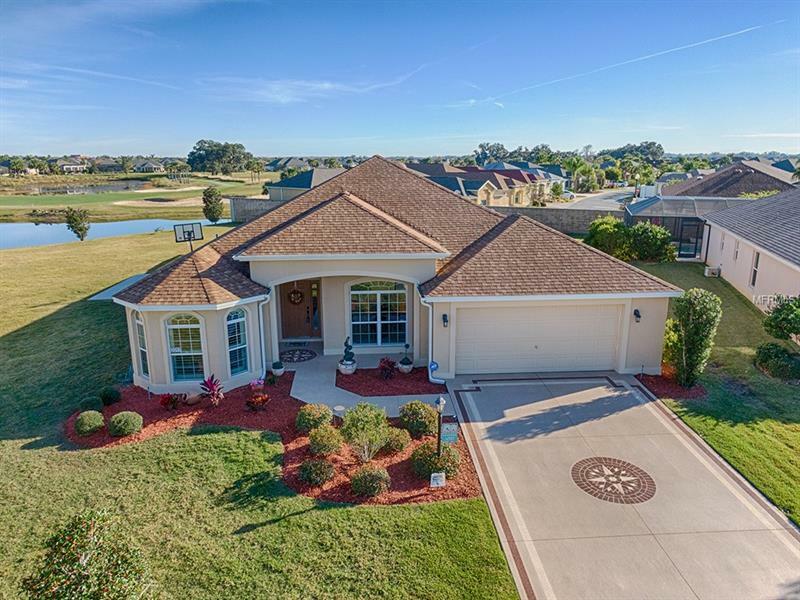 MILLION DOLLAR GOLF COURSE and WATER VIEW on this LOVELY ASPEN Designer with FABULOUS POOL and PRIVATE outdoor living space in the Village of GILCHRIST. This is a great home for entertaining indoors and out! This delightful home offers CROWN MOLDING throughout, WIDE-PLANK LAMINATE in the foyer, kitchen, baths and carpet in the living and bedrooms! The kitchen has ONE-OF-A-KIND HICKORY STAIR-STEP cabinets w/crown molding, hardware, pullout drawers, wine rack, bar area and features NEW STAINLESS appliances w/French-door refrigerator and SMOOTH-TOP ELECTRIC RANGE. The living/dining GREAT room have STACKING sliding glass doors that lead to the LANAI w/fireplace and motorized screens that turn the lanai into a warm room in the winter - an ALL SEASONS ROOM! The master bedroom features a tray ceiling, sliders to the outdoor playground, WALK-IN closet, and en-suite bathroom w/WALK-IN SHOWER and separate toilet room! Off the foyer are your two guest rooms. The front guest room features the unique architectural "witches hat" and eyebrow windows w/Plantation Shutters, guest bathroom w/tile surround tub/shower, window and linen closet in the hall. The custom pool features electric heater & solar blanket (warm water all Winter) and itâs great for swimming laps or playing pool volleyball. Other features include: large painted deck, screens for privacy, separate HOT TUB, ADT system, EXPANDED GARAGE and the list goes on!! This is a FABULOUS home site w/an AMAZING VIEW. Furniture available separately!